CF Galeries d’Anjou in Montreal will fill a significant gap in its retail space with the additions later this year of Old Navy, WINNERS and Saks Fifth Avenue OFF 5TH. CF Galeries d’Anjou in Montreal, Quebec. Shopping centre co-owners Cadillac Fairview and Ivanhoe Cambridge made the announcement this week. WINNERS and Saks Fifth Avenue OFF 5TH will debut at CF Galeries d’Anjou in August 2017, and Old Navy will open in October 2017. All three will be moving in to the space formerly occupied by Target. 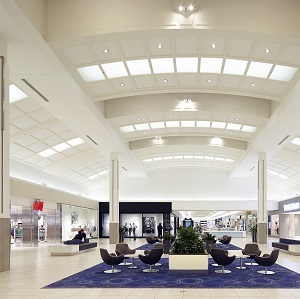 “We are excited to introduce three dynamic new retailers to the merchandise mix at CF Galeries d’Anjou,” said Brian Salpeter, senior vice-president, development for Cadillac Fairview, in a release to announce the leasings. The 1.1-million square foot shopping centre is located at the junction of Highway 40 and Highway 25 in the City of Anjou on Montreal Island. Saks Fifth Avenue OFF 5TH is a premium, off-price shopping destination offering designer brands, which will occupy 30,000 square feet. WINNERS, an off-price retailer that features an ever-changing selection of brand name and designer fashions, will also have a 30,000-square-foot store. Old Navy, known for its variety of family fashions, will open a 15,000-square-foot outlet. This will be the first Saks store in the Montreal area. The leasings fill the last remaining significant floor spaces in Galeries d’Anjou. What remains now is “small space” for smaller retailers on the first floor, a spokeswoman for the shopping centre told RENX. In 2013, CF and Ivanhoe Cambridge invested $86 million to expand and redevelop the centre, and at that time added Simons and Sephora to the retail mix. Sears, Hudson’s Bay and Sports Experts are among the other major retailers in the mall, which contains more than 175 stores, restaurants and services.